Hulu’s price changes seem to be designed to boost the number of basic subscribers watching ads. Unfortunately, the price cut was unnecessary and may also increase losses in 2019. In January, Hulu adjusted pricing for all its subscription streaming services. While subscribers to the company’s vMVPD Live service received a hefty increase of $5 per month, basic subscribers received an unexpected decrease of $2 a month, to $5.99. However, for those subscribers that have opted for ad-free viewing, the monthly subscription cost has not changed. Hulu boosted the cost of ad-free viewing $2 a month, to $6, keeping the total cost of ad-free Hulu at $11.99 per month. The pricing changes seemed to be designed to do two things: continue strong subscriber growth and boost the growth in advertising revenue. Looking at 2018 subscriber growth and other market conditions suggest Hulu didn’t need to cut the price of its basic service. Hulu gained 5 million subscribers over the 20 months between April 2016 and the end of 2017. It gained another 5 million in under half that time between April and December 2018. In other words, the Hulu subscriber acquisition rate more than doubled between 2017 and 2018. For all of 2018, Hulu’s basic service and Netflix’s entry-level tier were the same prices: $7.99 a month. However, Netflix announced it would raise the cost of its entry-level tier $1 a few days before Hulu announced it would lower the price of Hulu basic. At price parity with Netflix, Hulu experienced its fastest subscriber growth ever. Hulu might have been better off leaving the basic plan price the same. A $1 price difference with Netflix might have been enough to sustain or increase Hulu’s growth rate. When Hulu introduced the ad-free option in 2015 nScreenMedia suggested that $4 a month might not be enough to cover the loss in ad revenue. The price for ad-free viewing must have seemed cheap to many Hulu customers too. 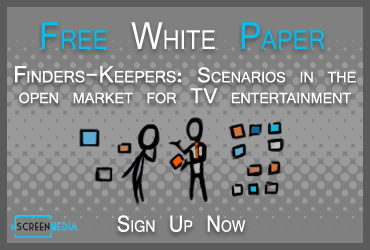 In 2014, nScreenMedia estimated that 59% of Hulu’s revenue came from ads and 41% from subscriptions. Fast forward to 2018 and ads delivered 36% of revenue versus 64% from subscriptions. In other words, a lot of Hulu subscribers have been opting to watch ad-free. The price adjustments should reverse the decline in the importance of ad revenue to Hulu. With such a big difference in price between ad-free and ad-loaded viewing, more new subscribers will opt to subscribe to the basic Hulu tier with ads. Further, some existing subscribers may drop the ad-free option. For example, Hulu Live with Hulu and no ads can save $6 a month (more than 10%) by agreeing to watch ads. What does it mean for Hulu revenue overall? It is doubtful that a $2 a month price decrease in the basic plan will boost the growth rate enough to cover the lost subscription revenue due to the increase. Hulu is betting that the increase in advertising revenue will make up the difference. 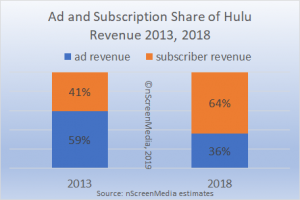 However, nScreenMedia estimates Hulu will generate less revenue in 2019 than if they had left basic pricing alone. Given that Hulu is running at a huge loss, the price changes may serve only to aggravate the problem. Hulu decreased the price of its basic plan by $2 a month and increased ad-free viewing by $2. The change will increase the number of subscribers watching ads. Unfortunately, the increase in ad views won’t compensate for the loss in subscription revenue due to the price decrease.